Brian Terrill's 100 Film Favorites - #78: "Ernest Saves Christmas"
It may be mid-July, but I’m in a saving-Christmas mood. Ernest Saves Christmas got some coverage in this past December’s “Christmas Classics Countdown” on my Brian Terrill Movie Night page, so I’ll try to keep this brief. Also, brevity is the soul of wit. Also, when I wrote this I was experiencing some mild Blowout-by-proxy inebriation. So this is gonna be short. 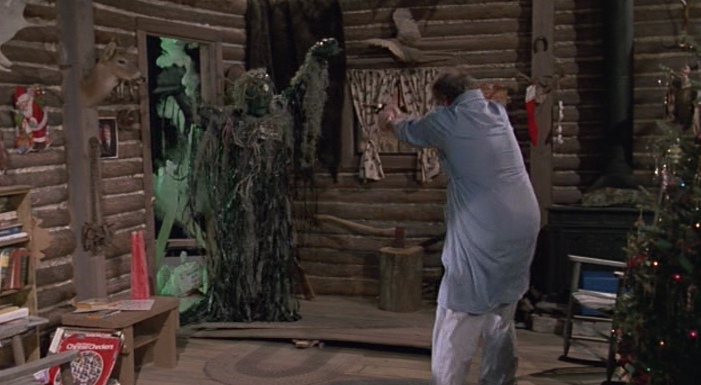 “Saves Christmas” is the second feature film starring Jim Varney as rubber-faced bumpkin Ernest P. Worrell, after 1987’s Ernest Goes to Camp (though the character appears in a more minor role in John Cherry’s earlier film Dr. Otto and the Riddle of the Gloom Beam). 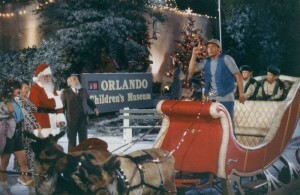 The film begins with Santa (in plainclothes) arriving at the Orlando Airport. 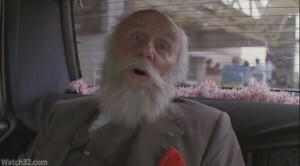 This is one of a number of films to portray the position of Santa Claus as a mantle which is passed on from one individual to another over the ages (The Santa Clause; Mr. St. Nick [the latter of which also features Charles Durning as Santa]). As such, this Santa (once a regular man named Seth Applegate) has come to Orlando in the hopes of “passing the torch.” Fearing he “hasn’t quite got the magic for another trip,” Santa must appoint children’s show host Joe Caruthers, the man he has chosen as his successor, as the new Santa before 7 pm on Christmas Eve. The agent repeatedly rebuffs Santa’s attempts to contact Joe, even going so far as to have him thrown in jail. Eventually, however, Ernest is able to bust Santa out of the slammer and collect all the requisite Claus accoutrements, including the sleigh, reindeer, magical sack, and a pair of crotchety elves (All of which have traveled to Orlando by plane or train for some reason. Maybe they need all their Christmas-power for the big annual flight, and using up any magic so close to Christmas might leave them low on fuel. I dunno.) Joe sees Ernest zipping across the sky in a frantic attempt to control the sleigh, and realizes that the old man claiming to be Santa Claus may not be so crazy after all. At the last moment, sleigh, elves, sack and Clauses reunite, and the old Santa passes on his power to Joe. 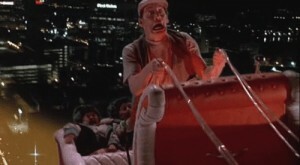 Joe takes to the sky for his first Yuletide flight, with “Ernest P. Worrell, aerial taxi” at the reins. 1. The “snake ranch” scene. 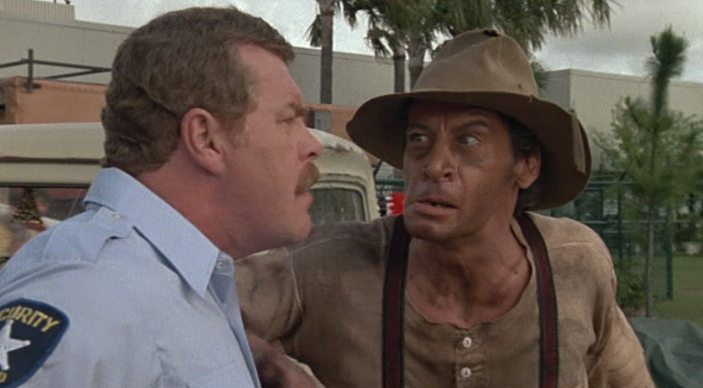 Ernest and Santa sneak on to a movie studio lot to meet with Joe. To get by the studio guards, Ernest poses as a Crocodile Dundee-esque worker from the “Apopka Snake Ranch.” Santa, hidden beneath a tarp in the bed of a pickup truck, wriggles around to emulate a cargo of agitated snakes. The guard moves in to check the truck anyway, but Ernest dissuades him, warning that “Dem’s pison, PISON snakes! PISON! They get all knotted up on each other…and when they get like that they get real CRAZY! Especially on a day like today…when it’s real HOT!” Mere text is failing to convey the power of Varney’s delivery, so you’re going to have to trust me that it’s both intimidating and insane. The guard is convinced, and everything is going well for our heroes, until their act proves so convincing that studio workers dump a load of actual snakes into the truck bed. 2. 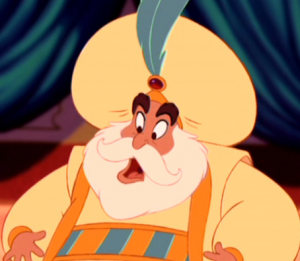 Douglas Seale, who plays the old Santa in this film, also voiced the Sultan in Disney’s Aladdin. Believe me, bros. It’s totes the same guy. -Why is the prescribed meeting time 7 pm? Old Santa says that’s the latest he can leave and still make his annual rounds in time…but shouldn’t he need to leave earlier than that? At 7 pm on the Eastern Seaboard It’s already midnight in Britain, and even later pretty much anywhere further east. -Santa has held the position of Santa for over a century. 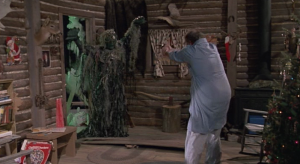 Once he hands over his Christmas magic to Joe, why doesn’t he instantly crumble into a pile of dust, bereft of the supernatural energy which had heretofore been keeping him alive? 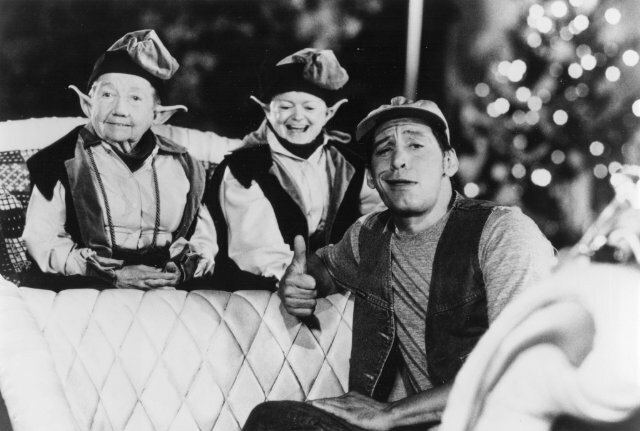 But if you can overlook such conundrums, “Ernest Saves Christmas” is a charming and offbeat holiday movie that’s a yearly favorite of mine. P.S. – Check out this ridiculously thorough video by YouTube star “AdamtheWoo.” Most of Adam’s videos involve “urban exploring” – investigating abandoned, cordoned off, and otherwise inaccessible buildings. But this series, in less of a gray area legally, features Adam checking out locations used in feature films. Here’s the entry for Ernest Saves Christmas.